In stock. Order in the next 10 hours, 16 minutes and it will go out today! When I was a kid, I was curious about the mystery of the sky. I often looked up at night and wondered about many aspects of the galaxy. One summer, my grandfather asked me, "Did you see the stars in the sky? That is Scorpio, the constellation that is your patron angel." It was my first time hearing the story about constellations. This concept made a deep impression in my heart. I began to study about the history and story about different constellations. The inspiration of this series of playing cards is derived from this. The constellation areas mostly had their origins in western-traditional patterns of stars from which the constellations take their names. 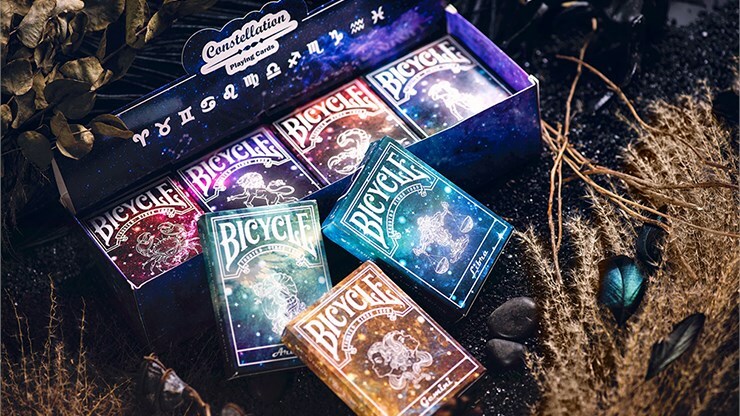 The constellation is generally considered as the essential component of astrology, and the cultural collision brought me the idea of designing one deck which is related with the constellations. The Scorpio is the closest to me, and my initial design was only one deck of Scorpio, including tuck case, Ace of Spades and Jokers. With the modern elements of inspiration, the first edition of the Scorpio deck came out soon. It received great praise from my friends, and they thought it was incredible. They encouraged me to design a series of constellation decks. Therefore, I designed 12 decks of constellations. The patterns of the background are all my interpretation of these zodiac signs, and all designs are hand drawn. I carefully ensured that the size of the design is in accordance with the size of the decks. I hope you will like my designs. Each card is elaborately made, and I hope you enjoy them. 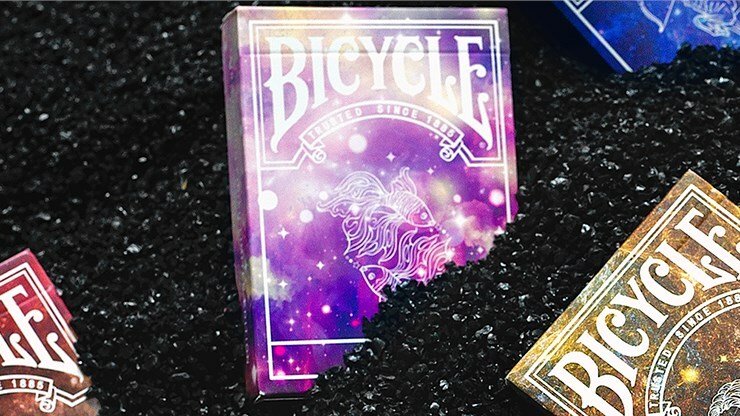 The Constellation Playing Cards features 56 custom cards printed on the classic Air-Cushion Finish. The deck displays beautiful and mysterious images of different constellations in the universe. 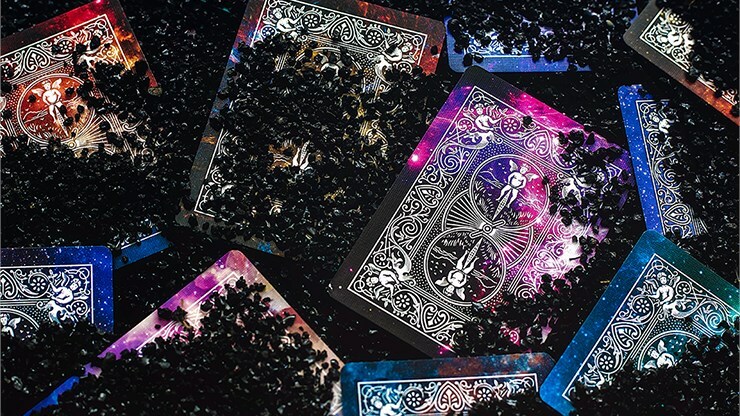 Released by Bocopo Playing Cards Company and printed by USPCC, these decks are guaranteed to mesmerize you. According to the different characteristics of each sign, I designed the card backs with a different feeling for each constellation. You'll notice the different moods right away. 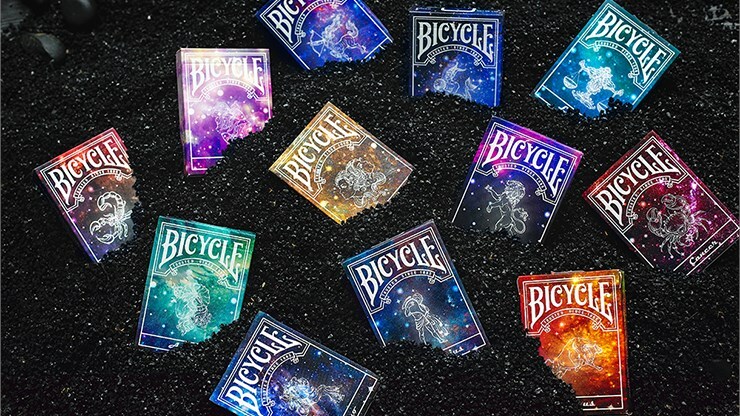 Each limited edition deck can fan from four different angles to create four different effects. At this moment, it seems as if the Milky Way is unfolding in your hands! This aspect is pure magic! 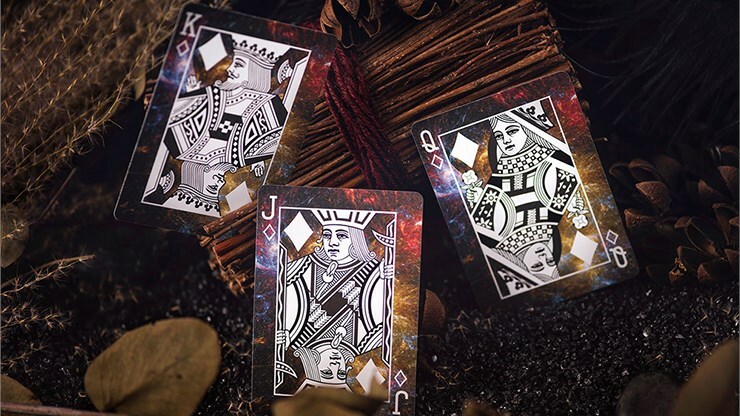 The Aces and the Jokers are engraved with the proprietary symbol of each sign. The color and background images of the faces work together in perfect coordination to show off the beauty and majesty of the constellations. Enjoy the different constellations in the collection. Each conveys a different feeling in a spectacular way.